The book is rigorous, technical and demanding, and deserves to be widely read and debated by mental health professionals looking for new models and directions. This is a complex and demanding book, but the topic could not be more important in our time. This is a book, both comprehensive and thought-provoking, with a timely thesis that is a “must read” for anyone interested in human behaviour and our collective future. […] This is a provocative and radical new way of thinking, and one that deserves our attention. It opens the door to new therapies that specifically target the corrupted emotions. Via a series of thought experiments, Blakeway offers a fascinating journey through evolutionary theory, philosophy and psychology. While assuming that humans are robustly logical, he explains self-destructive actions and ideological beliefs. From an innovative analysis of the Holocaust to reflections on rising fundamentalism, his argument is convincing. There’s something rather fin de siècle about 2014, and nowhere more so than in philosophy books. 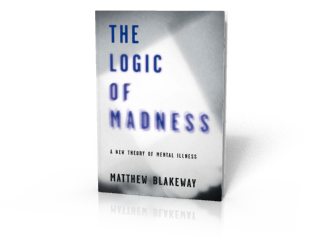 Matthew Blakeway’s The Logic of Self-destruction: The Algorithm of Human Rationality (Meyer LeBoeuf) is an ambitious survey.